Ong Dung beach (Bãi Ông Đụng) is a stunning beach on Con Dao Island. 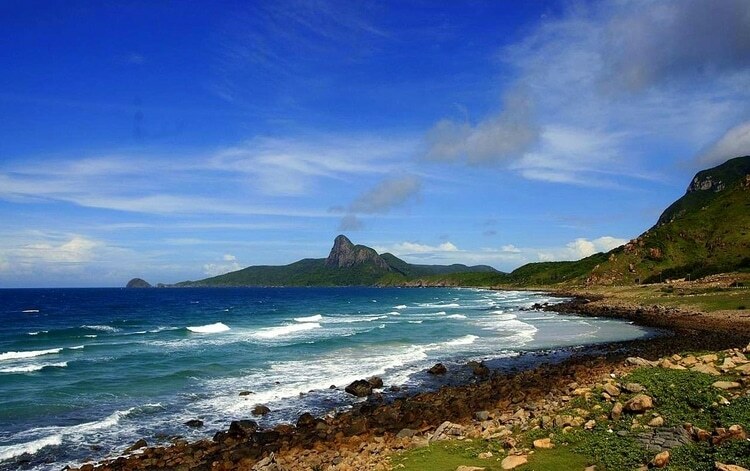 It situated on the west coast of the island, 2km from Con Son town center and 3km west of Con Dao National Park. The beach is nice with quiet and fresh space and pristine natural scenery. Besides, here has a diverse ecosystem with forests, sea, mountains, and coral reefs. Coming to Ong Dung beach, you’ll experience during your trip include snorkeling, swimming, hiking, fishing, through the pristine forest on Con Dao Island. The beach is one of the best tourist attractions in Con Dao. The rainy season in Con Dao is from June to September. 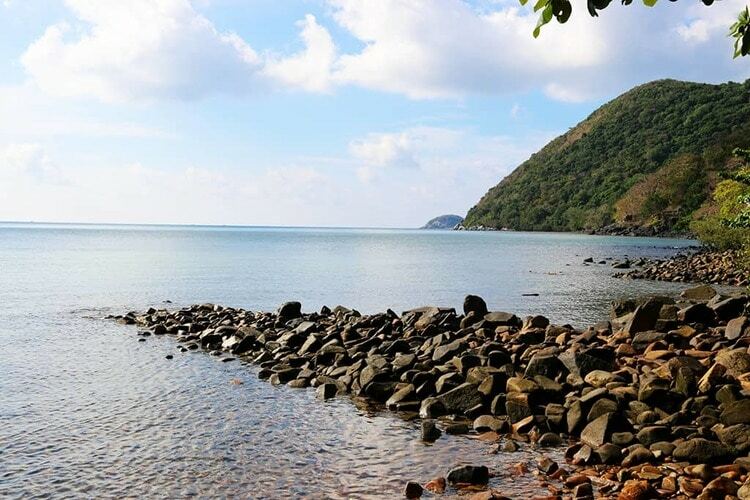 The driest months to visit Con Dao are from November to February. March to June would be the best time to visit Ong Dung beach. Ong Dung beach has a lot of small and large pebbles mixed with clear and blue sea and yellow sand which looks very beautiful. In addition to this, it has many big almond trees on the beach making it more attractive. Many boulders are lying all along Ong Dung beach. The beach shows the vast reef with strange shapes along with lots of species of marine life including crabs, snails, and sea slugs. Besides, surrounding the beach are the mangroves which are home to big mountain crabs. They have a dark yellow color and move foraging under the forest leaf. Ong Dung beach is quite rocky but beautifully peaceful. There is a little bar or house that offers snacks and cold drinks. They also offer packets of dried noodles to the local monkeys to munch on. When coming to the beach, you should try Kayzac sailing or snorkeling to view the beautiful coral reefs here. In clear water, you can see colorful fish swimming and unique creatures. If you go to the beach on low tide days, you can view the colorful coral world without diving. This will be an exciting experience that makes you remember nature and scenery here. Furthermore, the beach is ideal for scuba diving, snorkeling or fishing trips. It is also the right place for group activities, a picnic or camping. Plus, you can hire a canoe to discover the surrounding islands such as Big Bamboo Island, Small Bamboo Island for swimming, sightseeing and watching sea birds and corals. After the exhausting discoveries, you can enjoy the specialties of the sea and the forest here with your friends and relatives. Grilled lobster, shark’s salad, oyster sauce or fish sauce are one of the famous specialties here. At Ong Dung beach in particular and Con Dao in general, there is a well-known specialty called the rayed wheel limpet or Cellana radiate (Ốc Vú Nàng) with delicious taste. You can have steamed or boiled Cellana radiate. Plus, cellana radiate salad is very tasty. 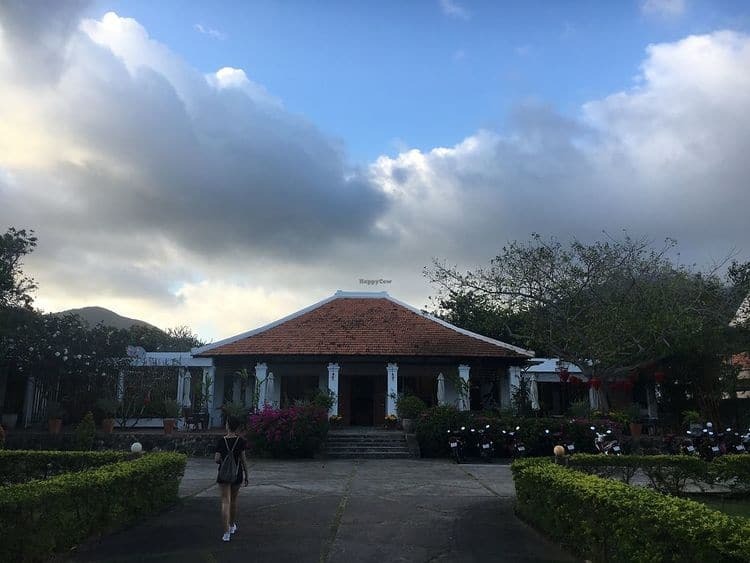 There are multiple options such as Con Dao Camping, Thien Tan Hotel, Six Senses Con Dao, Villa Maison Con Dao Boutique Hotel, etc. with the suitable price. Staying in these accommodations is convenient for visitors not only visiting the beach but also discovering other tourist attractions on Con Dao Island. Discover the forest edges, forest beach, and the rocky beach but be careful because you walk across the rocks. Take your time when you walk through the forest. Ask your guide as many questions as possible. Ask your guide to check the tide times if you want to snorkel here. Also, ensure you bring fins because you need to swim a minimum of 300 m to touch the reefs. For rock walking, strong sandals are a great idea. Ong Dung beach is a great spot for you and your family to relax. If you are searching for the beautiful beach on the island, it is regretful to neglect Ong Dung beach. Hope that you get helpful information after reading our article. Any question or query can be left in the comment box below, and we will reply as soon as possible. To know more about Vietnam travel, please visit our Vina homepage.